The interactions between humans whose territories are side by side are fascinating, and have been used as a basis for TV series for donkey’s years. A neighbourhood is a rich microcosm of society that illustrates the best and the worse of human relationships, which remain the same whether its occupants are penned in plush, posh houses for upmarket despotic housewives or popping in and out of the one-up, one-down terraced houses of Coronation Street. I have never understood how people can live side by side without ever speaking to each other, and I am often struck by the strange impression that the denser the human population is, the more lonely and anonymous people seem to become. This fear of alienation could explain why we have always lived in small towns or villages. In our microcosm, many of our neighbours are over the age of 70. When I saw my 85-year-old neighbour chuck his cane on the ground then take what felt like light years to kneel down in the dirt and play marbles with my kids, his eyes shining like someone 80 years his junior, I was thrilled. I think we all interact pretty well. 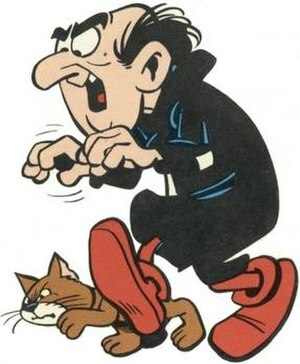 Gargamel goes through all the motions of a happy retiree, but something is missing. He somehow managed to plan everything for his golden age except the one thing you can’t put aside for a rainy day: what the French so nicely call la joie de vivre. Consequently, a black cloud hovers permanently over his head wherever he roams. You could set your watch by the regularity of his daily routine, executed with military precision. First thing in the morning, he cycles to the bakery with his trouser leg bottoms rolled up and carefully held out of chain’s reach with clean wooden clothes pegs. His trouser legs remain rolled up for the rest of the day, presumably to avoid getting the hems dirty. Then he returns home, tidies away the bike and the bread, and goes for the same walk he goes for every day. Garden, lunch, the news, an afternoon siesta, garden, dinner and the news. Then he spends all night awake because he had already slept all afternoon. The same routine – day in, day out. The bottle is always half empty in his book, and his upper lip curls with contempt at any form of kindness, optimism or spontaneity: kindness and friendship are merely social tools for sinister Machiavellian plans. Chewing on a toothpick, he complains in his nasal twang that the world is going to the dogs….. Any occasional, short conversation is closed with a perfunctory « Pfft. Have a good day, and walk in the shade », before he stomps home, his rolled-up trouser bottoms flapping a few inches above his ankles, and perceptible wafts of loneliness and vulnerability trailing behind him. Always the same remark: “Walk in the shade”. I tried to work out if there was a hidden message in there, to no avail. I have since concluded that it was his credo on life: If you keep out of the sun, you don’t get burnt. If you live life in the shade, nobody bothers you. Well…. I’m sorry, but although I’m not the type to sing Julie Andrews blockbusters in the garden during your siesta, walking in the shade just ain’t my cup of tea. I’m more a « sunny side up » kind of person. If life is a loaf of bread, I’m the slice of toast that always tries to land butter side up, then get back on the plate in time to see which jam is on the menu today, even if I am covered in dust and dog hair. The Gargamels in life used to sap my energy and make me sad. Now I smile, say hello and goodbye, then get back to the sunny side of the street rather than trying to drag them over with me. You live and learn. But if you need me, you know where I am, and you’re more than welcome to join me….